La variedad de leyendas del África negra se debe a la diversidad de tribus que la habitan. El ancestro de sus antepasados hizo que nunca se perdieran sus ritos y mitos ancestrales. Seguían adorando a los espíritus y genios que moraban la naturaleza.Los Luos, los Massais, los Swahilis y otros muchos más realizan sus plegarias, sus creencias en sus bailes y danzas que al ritmo de tambores hacen una delicia a sus honores. El aire, la tierra y el río, estaban plagados de espíritus a quienes se acudía y se invocaba, cuando se necesitaba una ayuda superior. “Jungla” es un Poema ambientado en estas danzas, en estos reclamos para invocar a sus dioses. En esta, se siente claramente su poder, su dominio…, su maravilla natural y espiritual. El poder de la grandeza y de los ancestros. Esta composición está dedicada a: …A Paco Campillo, por su excelente gestión por y para la Música, especialmente para las Bandas de Música, con especial cariño y admiración del autor. 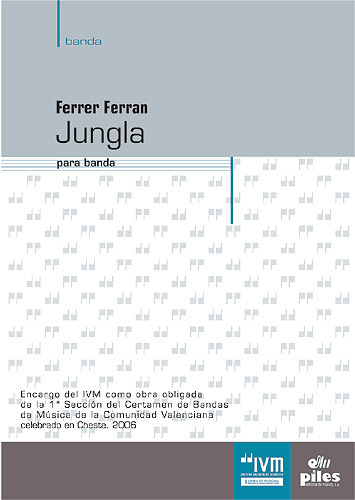 “Jungla” ha sido compuesta por encargo del IVM, para interpretarse como Obra Obligada en el “XXVIII Certamen de Bandas de Música de la Comunidad Valenciana”, 2006. The Heart of the Jungle, myths and legends remain awake and discovered this vast unknown world. The Luo, the Massais, the Swahili and many others performed their prayers, their belief in their dances and dances to the beat of drums make it a delight to his honors. The variety of legends of black Africa is due to the diversity of tribes that inhabit it. The ancestor of his ancestors made their ancestral rites and myths are never lost. Still worshiping spirits and genii who lived nature. The air, land and river, were plagued by spirits who were came and was invoked when a higher aid was needed. “Jungle” is a poem set in these dances, these claims to invoke their gods. This, clearly feels his power, his domain … his natural and spiritual wonder. The power of greatness and ancestors. This composition is dedicated to: … A Paco Campillo, for his excellent management and Music, especially for Bands, with special affection and admiration of the author. 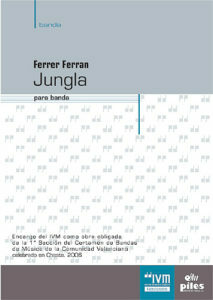 “Jungle” was composed by order of IVM, Forced to Work interpreted as the “XXVIII Contest of Bands of Valencia,” 2006. Que maravilla! te transporta, es alucinante lo que hace la música!!! Justo la escuché hace unos días en Youtube, extraordinaria!!! enhorabuena maestro. My name is Leen and I write you on behalf of Dynamic Symphonic Band from Dendermonde, Belgium, conducted by Geert Baetens. We’re a symphonic band in superior division with over 70 musicians. Our ambitions are high: during last edition of the World Music Competition in the Netherlands, we became vice world champion in second division and we’ll be competing again in 2017 in first division. We’ll be performing Jungla during our New Year’s Concert in January and the provincial competition in Belgium in March. We really enjoy rehearsing this piece as it’s quite different than the other pieces we play and it’s the first piece of your hand that we’re playing. So we’re very excited. It would be a great honor if you’d be open for an interview with us, whether it be via Skype or just via email. We believe this would be a great surprise and motivation for our musicians and a great way to learn more about the composer of this piece. Thank you for considering and Happy Holidays! The Republic of Slovenia Public Fund for Cultural Activities (JSKD) was established with the aim of promoting the development of amateur cultural activities, encouragement of their creativity in the cultural field and ensuring the availability of cultural goods and other activities. As a development institution JSKD provides and directs the professional and organizational support for amateur cultural societies and associations, and prepares and implements events that strengthen and enrich the quality of their performance. To ensure the preservation of concert implementation of those best amateur groups, Slovenian national television every year in cooperation with JSKD also record performances of selected groups at JSKD national project concerts. This year will national television record the concert of summer musical week (Musica creativa), where Slovenian National Youth Wind Orchestra is going to perform some quality works for Wind Bands. In accordance with copyright law, RTV Slovenia turned to us, as the organizers, that we get from all copyright owners an authorization for recording and further playback with archiving of already recorded material, which is going to be made on this event. 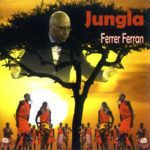 At your address, therefore we turn with a request, that RTV Slovenia may record and play on television the recording of your Ferrer Ferran: JUNGLA, Poema Ambientado en la Selva Africana, which is going to be on program on August, 23rd in Auditorium Portorož. AMO esa obra!!!! Con esa obra yo conocí su maravillosa música maestro!! !